Media making today is something fundamentally different from what it has been before. Content, people and platforms are connected and interact in increasingly dynamic ways. Filmmakers, storytellers, gamers, coders and designers have to learn to collaborate in order to invent thrilling media experiences for the future. The Bilkent Media Future Initiative is an interdisciplinary 4-day event built around various keynotes on technology, audience engagement, UX/Game design, transmedia entertainment in Turkey by industry specialists and a workshop in which students from different backgrounds create and implement new ideas for entertainment and culture in the digital sphere. 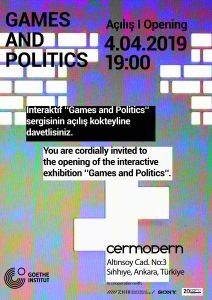 BMFI is hosted by the Department of Communication and Design at Bilkent University in Cooperation with the German Goethe Institute. The workshop is headed by the digital storytelling expert Prof. Egbert van Wyngaarden (Macromedia University in Munich, Germany). The workshop closing session is public and takes place on the 19th September at Bilkent University. For more details visit #BMFI’s website.